The distinctive diamond-cut texture of this classic Valentino chain creates a "starburst" design that reflects the light beautifully. 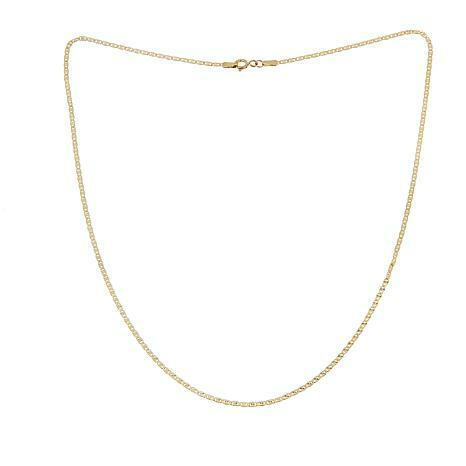 Layer it with other chains or wear it solo—it's the perfect topper for outfits ranging from casual to dressy. This chain is absolutely beautiful! Really unique, sparkly and eye catching. I love it!! A Beautiful Piece of Jewelry! 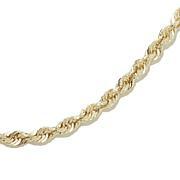 This chain can easily be worn by itself or with charms. Non-stop sparke! Quality Craftsmanship. This chain is a keeper for sure. When I received this necklace I did think it looked smaller than it did in the video. 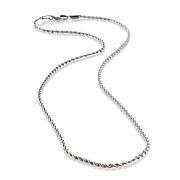 However it is a very beautiful chain. It is definitely more interesting than your typical chain. After putting my pendant on it I decided it is the perfect size, not a little thread but not so thick that it overwhelms my small pendant. I wish it did have a lobster clasp instead of a spring ring, But its not a dealbreaker for me. Overall I am very happy with the purchase. Is a very sparkly chain that looks more expensive than it was. I ordered this chain for a very special pendant my husband gave me. I was very disappointed when I received the chain. It is so thin and lightweight I would never trust my pendant on it. I also missed the fact that it doesn't have a lobster claw clasp. I tried and tried to put the necklace on to see how it looked. I was never able to get the necklace hooked. 'It will go back.